Biotinylated Human HGF R, His Tag (MET-H82E1) is expressed from human 293 cells (HEK293). It contains AA Glu 25 - Thr 932 (Accession # AAI30421.1). The protein has a calculated MW of 104.3 kDa. The protein migrates as 40-45 kDa α subunit and 80 kDa β subunit under reducing (R) condition (SDS-PAGE) due to glycosylation. The mature form of HGFR is a disulfide-linked heterodimer composed of proteolytically cleaved α and β chain. 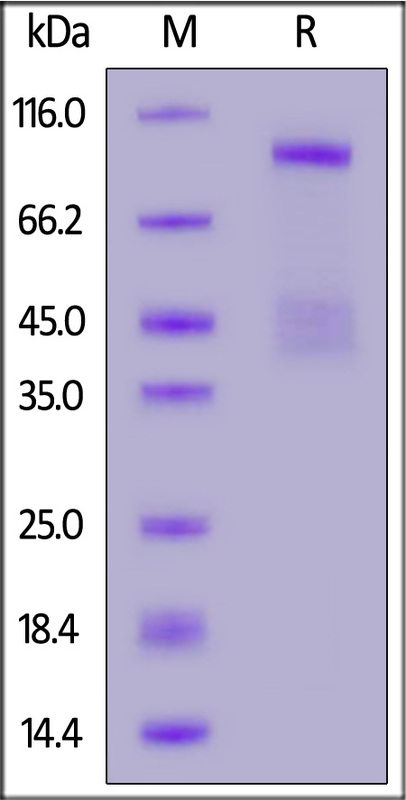 Biotinylated Human HGF R, His Tag on SDS-PAGE under reducing (R) condition. The gel was stained overnight with Coomassie Blue. The purity of the protein is greater than 90%. 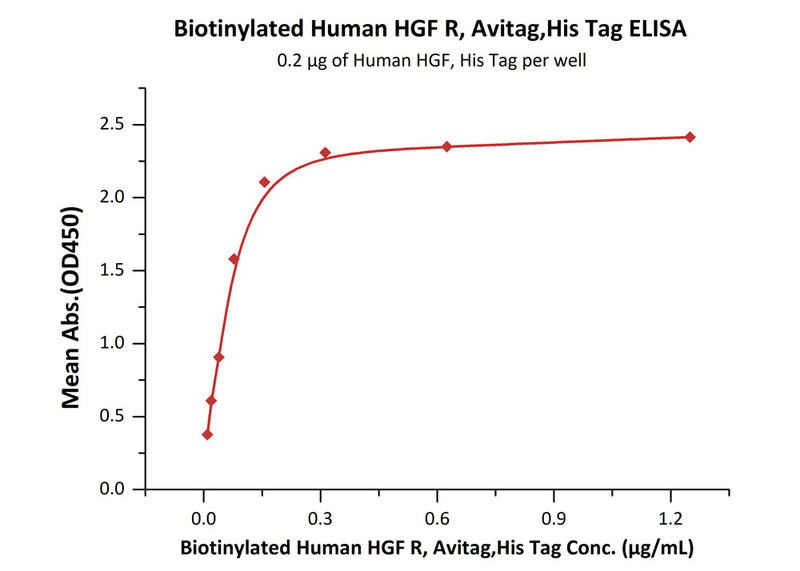 Immobilized Human HGF protein at 10 μg/mL (100 μL/well) can bind Biotinylated Human HGF R, His Tag (Cat. No. MET-H82E1) with a linear range of 0.04-0.31 μg/mL (QC tested). Authors: Shiyong Gong, et al. Hepatocyte growth factor receptor (HGFR) is also known as mesenchymal-epithelial transition factor (MET), c-Met, and is a glycosylated receptor tyrosine kinase that plays a central role in epithelial morphogenesis and cancer development. HGFR protein possesses tyrosine-kinase activity. The primary single chain precursor protein is post-translationally cleaved to produce the alpha and beta subunits, which are disulfide linked to form the mature receptor. HGFR is normally expressed by cells of epithelial origin, while expression of HGF is restricted to cells of mesenchymal origin. Upon HGF stimulation, HGFR induces several biological responses that collectively give rise to a program known as invasive growth. Abnormal HGFR activation in cancer correlates with poor prognosis, where aberrantly active HGFR triggers tumor growth, formation of new blood vessels (angiogenesis) that supply the tumor with nutrients, and cancer spread to other organs (metastasis). HGFR is deregulated in many types of human malignancies, including cancers of kidney, liver, stomach, breast, and brain. Normally, only stem cells and progenitor cells express HGFR, However, cancer stem cells are thought to hijack the ability of normal stem cells to express HGFR, and thus become the cause of cancer persistence and spread to other sites in the body. Various mutations in the HGFR gene are associated with papillary renal carcinoma. HGFR mediates a complex program known as invasive growth. Activation of HGFR triggers mitogenesis, and morphogenesis.